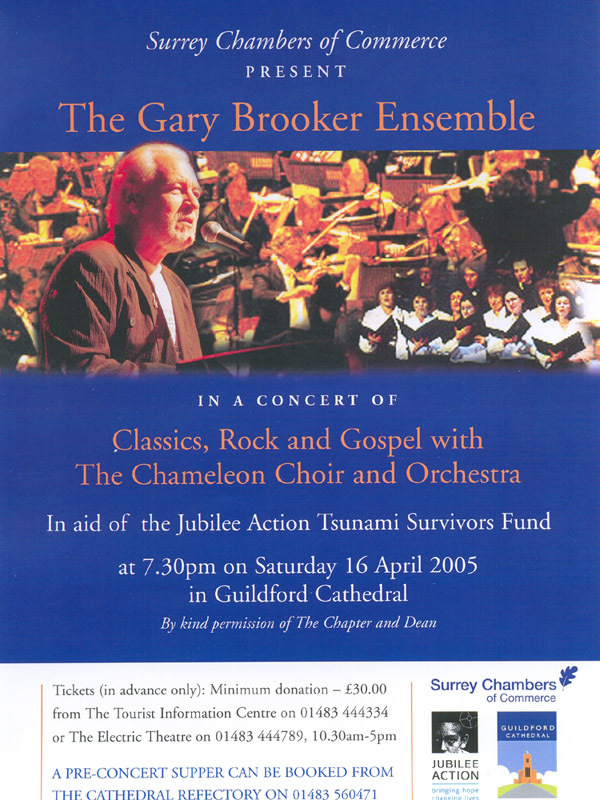 Gary Brooker (voice and piano), Henry Spinetti (drums), Andy Fairweather Low (guitar), Matt Pegg (bass), Frank Mead (saxes / flute) with the Chameleon Arts choir and strings and Jeremy Filsell on organ. 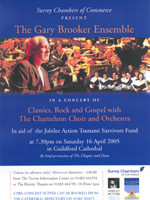 Paul Jones and Graham Broad will be among the musical guests. 'Beyond the Pale' is the only online booking office; fans who book through this route will be seated in a block near the front. If you want to be in that block, but don't want to pay online, drop us an e-mail. The Electric Theatre (01483 444789) is another booking option; with tickets from this source, you will be seated on a first-come first-served basis along with the rest of the possible 1,000+ audience. The Cathedral has a capacity of about 1,200 and seating (except for BtP customers) will be unreserved: first-come on the night, first-served.